Sen. Dodd told CNN Wednesday that officials in the Treasury Department asked him to add the bonus loophole to the stimulus bill before it was passed. 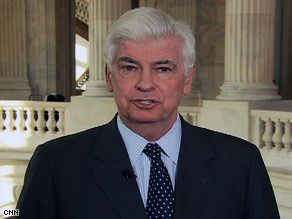 WASHINGTON (CNN) - Senate Banking committee Chairman Christopher Dodd told CNN’s Dana Bash and Wolf Blitzer Wednesday that he was responsible for adding the bonus loophole into the stimulus package that permitted AIG and other companies that received bailout funds to pay bonuses. Where are the checks and balances on the chairman of committees? You mean to tell me one person has this much power, no oversight, no discussion, no nothing. No wonder this country is in the mess it's in. Putting in his two weeks' notice a few months early.